These folks 100 years ago, loved Universalism so much, that they were going to have it preached, even if it had to be held in "Our Home". Not too early to ask for your concern and prayers and thoughts. 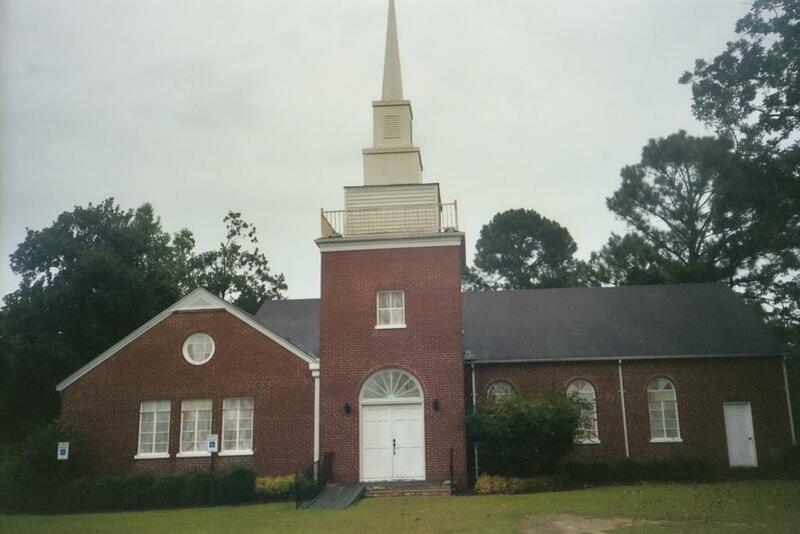 After attending the 75th anniversary Graddy*-Outlaw reunion at Kornegay NC, I attended sunday school at the Outlaw's Bridge Universalist Church. My plan was to take pictures of the interior to eventually put up on this blog -- but I was both so inspired and enjoyed myself so much that I didnt think of that after the service. Isnt that a wonderful way to leave church! Prussia and Denmark sign peace treaty. Browning has published her "Sonnets from the Portuguese"
Emerson (Unitarian) does the "Representive Man"
Hawthorn writes a "Scarlet Letter"
Alabama 4 meeting houses, 4 preachers, 1 periodical "Religious Investigator"
Among numerous other speaking engagments in Maine, the Rev. Miss Hannah Jewett Powell, who for so many years was our able missionary at Friendly House, North Carolina and who now resides at Waterville, Maine, spoke eight times in Oxford County during the Spring Season. Miss Powell spoke before the Ladies' Circle at the Turner Center Universalist Church; at one morning service on Woman's Day, addressed the children of the primary school; one grammar school assembly; the pupils of the Leavitt Institute; and at Canton addressed the high school pupils; and the Sunday School. Miss Powell also preached at North Jay Universalist Church on two sundays. Clayton Memorial is 100 years old! Clayton Memorial celebrated their centenial on August 21, 2005 --- with history, dedication of a new sign (which makes them an Unitarian Universalist, rather than an Universalist Unitarian), and a new minister. ok, below is an ad off of abebooks.com for Father's Clayton's autobiography. Its a good book, but I sure didnt pay anywhere close to that price for my copy! anybody know who John Adams was? and from where? Back to the more normal: old newsbitsTHE UNIVERSALIST BANNER October 1936 - the Maine Universalist Convention official organ"Through arrangements with the (Maine) superintendent, the Rev. Ordel E. Bryant who has been in Maine on leave from the Clinton Circuit in North Carolina, of which he is the missionary pastor, served as resident minister of the First Universalist church at South Paris (Maine), preaching there at 10 A. M. And of the West Summer universalist Church, preaching there at 12 M. Throughout the month of September. The Superintendent arranged for a service at the Bethel Universalist Church which has been closed for several years for September 20th when Mr. Bryant preached at 9:45 A.M. rearranging the services at South Paris and West Summer for this Sunday to meet the needs of Bethel." The oldest surving Universalist Church in the Carolinas - services held every sunday, why dont you go and attend? 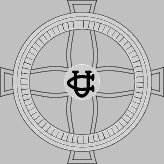 This Sunday, August 21, 2005, Clayton Memorial Unitarian Universalist Church of Newberry SC will celebrate its 100 anniversary of their building! Daniel Bragg (D. B. ) 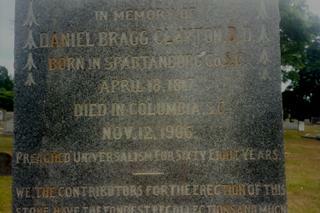 Clayton was born in what is now Woodruff, SC. He grew up in a Baptist household, converting to Universalist after reading Universalist newspapers and hearing SC circuit riding Universalist minister Allen Fuller preach. He was ordanined by Fuller and took over the circuit, when Fuller moved west. 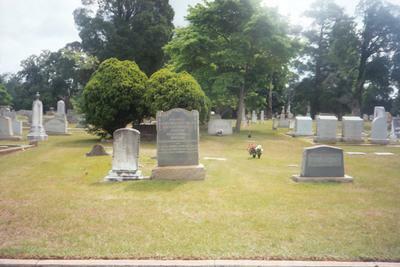 In the late 1840s, Clayton himself moved west; settling in Mississippi. During the war, his home and library were burned down, and Clayton returned to SC. After the war, he owned a hotel in Columbia, and preached part time. In 1880, he moved to Atlanta to edit a new Universalist paper started there. He returns to Columbia a few years later, and except for a short time living in Cash's Depot; he spends the rest of his life in Columbia. Well the rest of his life where he is not a traveling Universalist missionary that is. Father Clayton goes to preach in Georgia. Florida, Alabama, Mississippi, Tennessese, North Carolina - and even once as far west as Texas. In 1906, getting ready to head to the train station to head to Greenville, NC; he suffered a heart attack and died. at one time, he had two Universalist Churches named for him, the one in Newberry SC still lives. they went to church at the fairly new Republican Meeting House - I've tried to find out where that was for a long time. Republican Meeting House meant it was originally an Union Meeting House, where various churches shared the building.